The clever house from "Tria Komm"
The "TRIA" company was set up in 1993 by the group of specialists who amassed the largest experience in the establishment and maintenance of various civil and military engineering systems. Intellectual housing (economy, comfort and cosiness). The training of the Client’s personnel to observe operating rules of the installed equipment. The priority directions in the activity of the TRIA KOMM Company is to guarantee reliability, economy and autonomy of the operation of the equipment of engineering systems we offer. The average age of the employees of our Company is 37 years, 78 percent of them have higher technical education. They constantly master products of leading domestic and foreign producers, and we offer our clients the equipment of exclusively high quality. Among our clients we have industrial and civil enterprises, legislative and state bodies, trading and entertainment centres (theatres, discos, restaurants, bowling clubs and bars), cottages and apartments. We also have the opportunity to show You the quality of our works at operating objects and those under construction and to provide the responses of our Clients and Partners. Phone/fax: (495) 739-37-76, 739-37-78, 739-37-79. 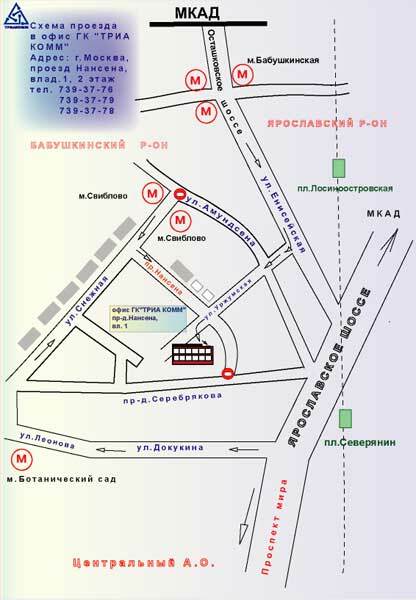 The Address: Moscow, travel Nansena, possession 1, 2-nd floor. О системе "Умный дом" на русском.